Wednesday, the City Council will vote on Mayor Rahm Emanuel's budget proposal, including a property tax hike of almost $600 million. We ask the mayor whether his proposal has enough votes to pass, whether it contains enough revenue to right the city's fiscal trajectory, and if it's risky to depend on money coming in from Springfield. We also ask him about the plan to let Uber and Lyft drivers pick up passengers at Chicago's airports, and about the state of public schools. Thank you to all of our viewers who sent in questions on our website and on Facebook and Twitter. Below, some highlights from our discussion. "There's going to be a majority for finally dealing with and confronting our fiscal challenges, for getting our structural deficit under control. There's going to be a majority to investing in modernizing our schools. There's going to be a majority for meeting our obligation to our police and fire pensions, and doing it in a way that's responsible, fair, progressive to everybody. There's going to be a majority to get all of the gimmicks out of the budget that have been built in for year after year that [have been] covering–and in my view, not being honest with the public–about the true cost of government. "That's why the Civic Federation endorsed this budget–they didn't endorse budgets back in 2010 and 2011; that's why the Chicago Sun-Times endorsed this budget, because we're actually doing the tough and necessary things that are essential for Chicago's future." "The Civic Federation is not an easy grade. We're going to make major cuts and reforms; $170 million of reforms in the system; over the last five years it's been close to $600 million in cuts, reforms and efficiencies. I think that's the right thing to do. I acknowledged up front [that] it's going to be tough, but what's tougher is allowing the city to continue to live on borrowed time, not be honest with people, and not do the necessary things that we have to, to ensure our future. "They acknowledge that this is the right thing to do. Laurence Msall and the Civic Federation does endorse our budget because it actually meets our obligations to fix the fiscal house of the city of Chicago and do it in a way that is responsible." "Ever since we've proposed our budget, our airport bonds have been upgraded; our sewer bonds have been traded [up]; our city's bonds have actually traded up. What has happened to the state ever since they had inaction? They've been downgraded by Moody's and the other service agency. We're actually taking the step necessary to shape our future." "I became mayor in 2011. The city of Chicago was still in the midst of a recession. A lot of people's home values were upside down–and they were not even totally out of that. I think it would have been reckless, while the economy was just in the beginning stages of turning around–people's home values were upside down–[to say,] 'Let me tell you how we're going to solve our problems, I'm going to raise property taxes.' I said no, we're going to make the politicians get the politics out of the budget, to the tune of nearly $600 million a year. And now, as it relates to the police and fire pensions that Springfield mandated we pay–in 2010 they said that–we're going to do it in a way that meets our obligations. "I understand why homeowners are upset. But if we continue to allow that to slide, it would actually take the city into financial ruin, and the alternative–let's be clear–we'd have to cut police by 2,500, we'd have to cut the fire department by a couple hundred firemen, we'd have to end garbage collection every week, we'd have to end recycling, tree-trimming, rodent control, graffiti removal. That is the alternative. I reject that alternative." "I'm not going to allow Springfield's dysfunction to become Chicago's dysfunction. Springfield is 120 days behind passing a budget–the worst in the state in history. We're 30 days ahead of schedule. Springfield is cutting kids off of daycare. We're adding kids to pre-K, after school and summer jobs. Springfield is missing their pension payments; we're going to make our pension payments. Springfield's unpaid bills: $6 billion; Chicago: meeting its obligation. Springfield has businesses nervous and talking about leaving. ConAgra left Omaha, coming to the city of Chicago. "My recommendation? Springfield get their act together and start acting and doing its job, just like Chicago's doing. We are the economic engine of the state. The state would be nowhere without the city of Chicago." "There was a whole system there, legal and otherwise, to vet. Barbara Byrd-Bennett presented herself as a teacher, as a principal, as an educator, as an administrator. And she betrayed all of us, most importantly, she betrayed the kids of the city of Chicago and the teachers who thought they had a kindred spirit. You can't vet for what's in somebody's heart and motivation. Even Zach Fardon, the U.S. Attorney, noted she hid it from everybody and acted alone. There was a lot of people that were involved in the background checks. There isn't a vet for character." "My entire focus right now is on passing the budget tomorrow, making sure we do the things necessary for the future of the city of Chicago, making sure we that actually bring safety throughout the city of Chicago, making sure that we continue to make gains educationally. That's where my energy is. I don't know what I'm going to do Friday night or Saturday night, let alone whether I'm going to see that movie." Watch the video to hear the full discussion. Want to contact your alderman before tomorrow's vote? Use the map below to find your ward and alderman's email address. In September, the mayor unveiled his proposed 2016 budget, which includes a $543 million property tax increase that would be phased in over four years. Without a property tax increase to fund the city’s police and fire pensions, Emanuel said drastic cuts would be made to citywide services, including laying off thousands of police and firefighters. Fees on ride-sharing services, taxis and garbage collection are also included in the budget proposal. 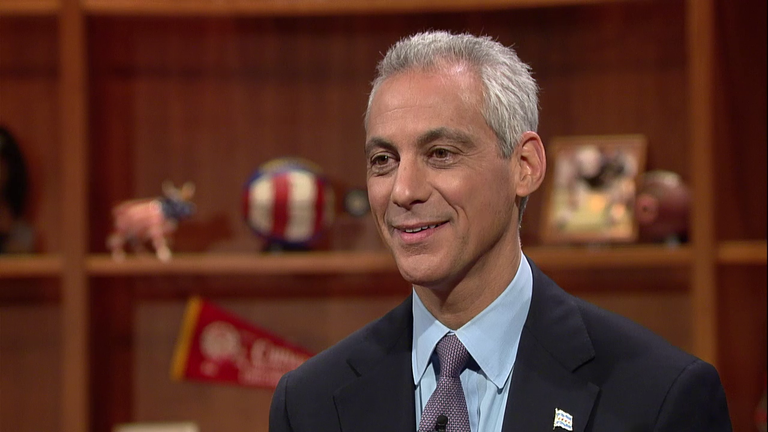 After being called on by Mayor Rahm Emanuel to step up to the challenge and approve his “last resort” budget, “Chicago Tonight” asked a panel of aldermen for their reactions. We heard from Ald. Jason Ervin (28th Ward), Ald. Ricardo Muñoz (22nd Ward), Ald. Patrick J. O'Connor (40th Ward) and Ald. Carlos Ramirez-Rosa (35th Ward). Ahead of the mayor’s budget announcement, news broke about his plan to shield low- and middle-income homeowners from a potential massive property tax increase. It was reported (and subsequently confirmed in Emanuel’s budget address) that homeowners who live in properties worth $250,000 or less would be exempt from paying any additional property taxes.